Okay. It’s obvious this mess didn’t happen overnight. This peony bed was created in 2002, and my weeding practices have been, at best, inconsistent over the years. I’m really not sure what year the Canada thistle showed up, but since I wasn’t aware of how extensive its roots could get, I didn’t give this weed the immediate attention it apparently so richly deserved. I’m sure many times I looked at those spines and thought to myself, I’ll pull that the next time I have gloves handy. And even if I had gone to get gloves, the odds that I would have been distracted from my task by some other domestic duty or child-induced problem would have been pretty high. I’m not saying I never pulled the Canada thistles, I’m just saying I never pulled them frequently enough. Canada thistle allocates most of its reproductive energy into vegetative propagation. New shoots and roots can form almost anywhere along the root system of established plants. Tillage segments roots and stimulates new plants to develop. Shoots emerge from root and shoot pieces about 15 days after disturbance by tillage. Small root pieces, 0.25 inch long by 0.125 inch in diameter, have enough stored energy to develop new plants. Also, these small roots can survive at least 100 days without nutrient replenishment from photosynthesis. Removal of shoots and severe damage to established plants stimulate new growth from underground buds. It is the buds on the creeping roots of established Canada thistle plants which largely account for re-establishment after attempts at control. Buds on creeping roots can generate new shoots a year or more after top-growth has been destroyed. So I think by pulling and digging, I actually encouraged the thistles to make more shoots and more roots. It’s one devil of a weed, I’m telling you. Those roots have to be deprived of nutrition over and over again to eradicate it. In established plants of Canada thistle, carbohydrates move from the root system up to the newly forming shoots as growth starts in spring. As leaves on the shoots develop, photosynthates start moving to newly developing roots and flowerheads. The developing flowerheads take more and more of the energy (photosynthates) produced by the leafy stems and stored in the roots. Carbohydrates in the root system are at their lowest when the plant begins flowering. After the research I’ve recently done on Canada thistle, I know this is just the first round in a long fight. The peony bed looks a lot better at the moment, but I have no illusions about the future. I made the mistake of pulling thistle up for about 4 seasons until I finally realized I was stimulating the plant. I had an incredible thistle patch. I did not want to spray but I knew I would need a chemical solution. What I did was to get a heavy duty veterinary hypodermic syringe and roundup concentrate. I mixed a solution of about 30% roundup. I then cut the stems of the thistle and injected a small amount of the solution down the center of the stem. On the smaller plants that had not developed a hollow center I just squirted a bit on the top of the plant, This method was a bit tedious but worked exceptionally well and I was happy I avoided spraying. Like many of you, I am just now realizing what a plague this weed is. I’ve let it get a foothold in our beds for about 3 years now. Like many of you, i have pulled out the weeds and think I’ve done more harm than good. I’m reading all sorts of things, and am confused on something, maybe someone could help clarify…. 1. Can i just apply RoundUp to the plant when it is small or do i need to let it grow tall before i lop it off. 2. If i need to cut it off, do i apply the roundup to the stem that is left behind? 3. If i apply RoundUp to the plant, do i put it on all the leaves or just spray it at the base of the stem? Any help would be appreciated. I fear that if i let it grow too high and there are seeds/flowrs on it, the wind will blow and it will make the situation much worse. I was told to cut the tops off the Canadian Thistle and pour used motor oil down the shaft. I have not tried it yet but was wondering if anyone else has. I let my thistles get about 2 feet tall, cut them off, and then use an old paintbrush and literally paint it all over them. in about an hour, they wither, and overnight, they turn black and start to die. it was recommended to do this on a moderately warm and sunny day without forecast of rain – apparently, their root systems are most active on a cooler day and it’s most effective then. have to say it really works. it’s vicious stuff and so satisfying to see them dying back. very few grow where they have died; i was told it may take a couple of applications to really kill the root system. Wow. Thank you for posting this. I have struggled with thistles since the first year I have lived in my home – well-intentioned friends tilled and mulched my front flower beds as a house-warming gift, and sadly, the mulch they used was mixed with thistle seeds. Thistles have been the bane of my front flower bed’s existence for three years. I am trying the boiling water method today – it does seem to cause instant damage, as the thistles curl up and turn black almost immediately. I am praying that this somehow impacts the horizontal root system; these things are incredibly evil and tenacious. I, too, have tried every chemical, household vinegar, simply pulling and mulching – who knew mulch was such a wonderful environment for them to flourish – everything. My last ditch effort is the boiling water. Keep your fingers crossed it works! I want my spring bulbs to be thistle-free. 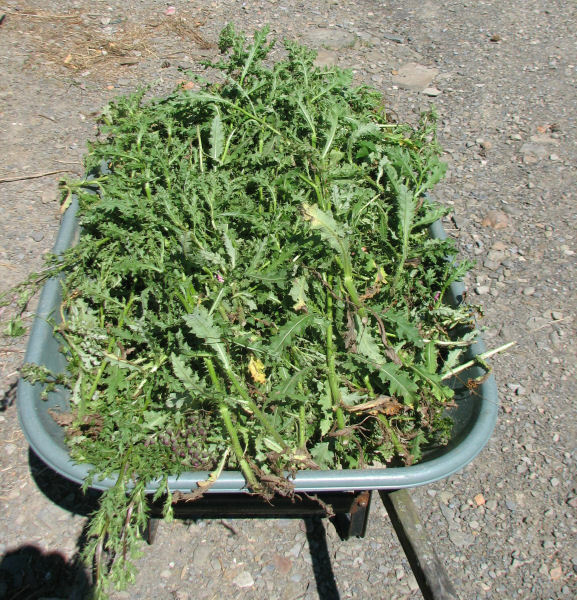 BTW – the photo of the wheelbarrow was entirely too close to what my piles look like when I weed and pull thistles. *shudder* I feel your pain. Brandy, I brushed Roundup on the thistle leaves after the good plants have died back in the fall. This has really helped kill them off. thank you! i am thrilled to say i finally found a product that *really*really*really* works. and it won’t kill the checkbook. You might want to update this. It’s been a problem in farm fields since the turn of last century. Plucking or cutting it are both about the same, but you have to do it repeatedly. The old pre-herbicide way to deal with it was to clean cultivate every three weeks for a full season. We just did that to a half-acre or so of infested area on our organic farm. Clean cultivating means removing everything. So I hooked up sweeps to our cultivator, and did the whole half-acre about six times, from May to August. Sweeps work kind of like a hoe, both slicing things below the soil surface and lifting the soil surface to ‘pull’ the plants out. After leaving the field completely bare for four months, I planted the field to winter wheat. The wheat is supposed to provide enough competition to keep the canada thistle at bay for the spring and summer, at least. It may be largely gone from the middle of that field, but it will start creeping in from the edges. The other organic way to deal with it is to combine a strong smother crop with frequent cutting. Supposedly sudan grass is about the best, since it’s a strongly growing annual. It gets up to 6 feet tall and grows back quickly once it’s cut. We’ll be putting most of the rest of the infested area in sudan grass next spring. Then we’ll be cutting the sudan grass about once a month for the summer. The nice thing about the sudan grass is that it’s providing a good organic mulch while dealing with the canada thistle, as opposed to the clean cultivating, where we’re losing organic matter all summer. The overall point is that you need to smother the thistle, cut or pull it frequently and persistently, or apply herbicides persistently. You’ll do the most damage to the plant if you can wait until just before it flowers to pull/cut it, but then you risk spreading seeds if you can’t get it cut fast enough. No fun no matter how you cut it. I removed an old azalea bush from one of my front gardens, and while I let the soil rest, I neglected to mulch. I then discovered this very nasty weed that I pulled for the season and it seemed to go away in early fall. It came back with a vengence in the spring of 2006 so I took a sample to my local nursery and I was informed it was thistle. In the meantime I had planted a white bleeding heart where I removed the azalea and the thistle are taking over! I know now that I shouldn’t have been pulling the weeds. After doing some intense research, I found some advise to dig out a layer a few inches deep (up to 6″) of soil and use some type of material to cover affected area – like a piece of old carpet, sheet metal – something dense to prevent the thistle from breaking through. Heavily mulch on top of the barrier. He also advised that garden strength vinegar is a good way to kill off thistle but you have to be really careful with it. Regular vinegar you buy at the grocery store is not strong enough. I’m so frustrated with trying to keep ahead of the thistle! My worry is that it will take over my gardens and I have some beautiful long-established white and pink bleeding hearts. In England we call it creeping thistle, any guess as to why? Back in the summer I had to remove a rather large patch from my neighbour’s garden, I estimated there were between 100 to 150 thistles, some had grown to over 4ft tall with the average height being closer to 2ft. With such a dense patch there was little hope of going in with a spade, after what I read I gald I didn’t. Again due to the density I couldn’t risk herbicide or cutting them down due to all the srubs the thistles where growing around and sometimes through. So I pulled them out, I wore my PVC chemical gloves (Picked them up for $5 while visiting friends in NH) and just pulled them out, also removing around 6 inches of the root with each stem. They started to grow back 5 weeks later but not to the extent they were when I pulled them. I have found to my dissmay that glyphosate isn’t 100% effective against such an established infestation, especially when you meausre their height in feet; only ways I know to remove creeping thistle for good, and both are very drastic, is to dig up the area with a JCB and replace the soil or treat the thistle with very harsh chemicals; a mix of sodium hyroxide (lye) and any non-acidic or salt based root absorbed herbicide. It is important to apply this mixture by spray from max effect, on a warm sunny day most surface growth will be dead and brown in an hour. Using concentrated acetic acid in place of the lye is an enviromentally safer opption but both can cause a dangerous soil pH shift in the immediate area, they may also be other side effects depending on what other herbicides are used. The most powerful and easily accessable mixes I found to be is lye and sodium chlorate (not sure on avialability in North America.) Stay away from chlorates unless you don’t want anything to grow in the treated area for a while, also because of its chemistry you cannot use chlorates with acids, hense why I used lye. This stuff is best used on paths and drive ways as it is the atomic bomb when it comes to weed killers. We have been pulling up thistles in the same spot for over 5 years. They never get to the flowering stage so I didn’t know how we kept getting more every year until I read your post. All those years I thought the seeds from a plant remained dormant and would periodically sprout! I guess we have a battle on our hands. Thanks for the informative post. Kathy: I know exactly where you’re coming from. Just this weekend I pulled out some big thistles that I had sprayed with Roundup about 2 weeks ago, and I was planning to blog about my conflicted feelings about it this week. In the 8 years I’ve lived in this house, the only things I’ve used Roundup on are canada thistle, creeping charlie in my gravel paths, and little tree seedlings growing out of my rock walls. Like Jane, I’ll spend hours digging out dandelions by the root (or ignoring them), but there are a few weeds – or places where they grow – when that just won’t work. 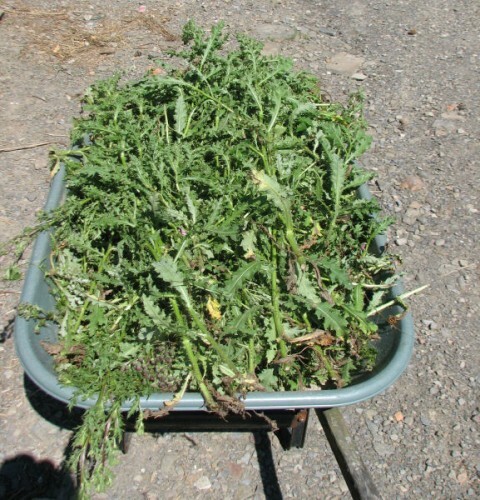 My thistles were primarily located between a chainlink fence and garden shed – a 6 or 8 inch space that it was impossible to get into and weed by hand so I gave up and started using roundup on them. I have a spray bottle where the spray can be directed fairly well (not much overspray) and every time I see a thistle pop up I isolate it as best I can from surrounding plants and spray it. Going to roundup was a huge measure of my frustration – I spend 15 minutes every night digging dandelions out of my lawn rather than use herbicides on them, and even the ex-neighbour’s goutweed (the current occupants of that house and I are of one mind in the elimination of that scourge) and the creeping bellflower haven’t pushed me that far yet (although I’m getting close…). I’m sorry to see that dreadful problem you have there. I’m glad to have never known the Canada thistle on my property. I have read in blogs however, about otherwise organic-type gardeners resorting to glyphosate (Roundup) for this particular weed. Of course, you have to be careful to paint or sponge it on, avoiding other plants. I have heard that glyphosate breaks down quickly, so is not a harm to ground water, etc. Thus, I don’t feel entirely terrible using it if I need to. That horrible thistle seems to warrant some herbicidal help. That’s a bunch of nasty-looking customers you’ve got in that wheelbarrow! I get a few of them here and there and even let some flower (for the goldfinches) but for some reason they’ve never been prevalent in my garden. A couple of years of pulling them out by the roots does seem to discourage them, but that’s not very practical advice when you have lots of them to deal with. And prickly? Ouch! Carol,Verdant Heart, and Robin–the trouble with herbicides (or boiling water) is that they are not selective. They kill everything they touch. 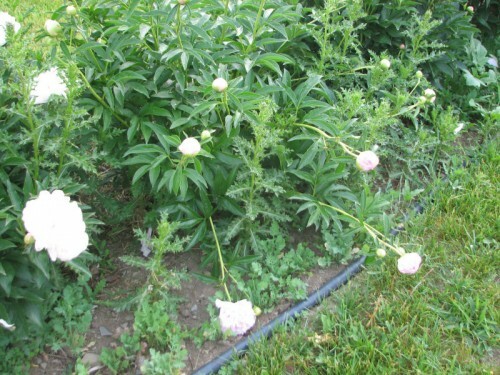 Before I spray Canada thistle with anything, I want to be positive the peonies aren’t going to be harmed. That will take some thought. I also have self-sowing poppies and larkspur in that bed, and I would probably lose some of them. Most of the sites I looked at recommended a multi-pronged approach that involved both spraying and cutting down. I didn’t want to use images without permission, but if you went to some of those web sites you probably saw pictures of how extensive the root system is. Kelly, if you’ve truly lost your other plants, you might want to spray with one of the herbicides mentioned above, just to keep your house looking presentable. It’s hard to see something you’ve put so much work into ruined like that, but you need to view your house objectively, like a prospective buyer, and most of them are more concerned about the landscape looking neat, not pretty–as I’m sure you already know. I made the mistake of pulling for a few seasons at the house we’re still trying to sell. Too late, I did some reading on the subject and now fully understand the grave mistake I made. That mistake was highlighted when I went out last weekend to deal with the lawn and saw that what once were beds with bulbs, climbing rose, moon flower and spiderwort, are now beds of 5-foot tall Canada Thistle. I cried. I feel your weeding pain! We have similar persistent weeds with underground roots here in Maryland. If they get into a place where I won’t harm the other plants with it, I pour on boiling water. It kills everything. And no chemicals. Welcome to my world. Over the past decade my CRP land has been infested slowly, at first, with canada thistle. After a lot, I mean one hell of a lot of struggle, I settled on the herbicide ‘Stinger’ . I really hate to use the chemical method but I consulted with an expert (university expert) on what to do. This herbicide really works on Cirsium arvense. After using it on a large field of thistle I now keep a small bottle (16 oz) of the chemical at the ready. Whenever I find a Cirsium arvense I make sure it isn’t too near other plants (I force it flat on the ground) and then spray it. I leave a marker (a stake or flag) so I can go back to catch any new sprouts. Any attempt to physically remove plants larger than 4 or 5 inches will result in more plants from the root pieces. The plant is insidious with it’s underground roots but also with the airborne seed spread. Stinger is not inexpensive but it is the only thing that I have found that works except clearing the area and using glyphosate, Round Up, for a year or more. You can only find it at a ag chemical distributor lie a local farmer’s co-op. I have some Canada thistle “colonies” in a few places, as does my neighbor. I hate the stuff. I guess after reading this, it sounds like a bit of procrastination on pulling until they are just ready to bloom is one way to slow them down. Thanks for all the research!